First, there was DAB. Broadcast over radio waves, it offered a reliable signal with excellent sound quality. Then came Internet Radio. It also offered great sound quality, but due to its reliance on servers and all the issues that can arise surrounding them, it was often frustratingly unreliable. While we wait for a seamless amalgamation of the two, then, we have the Pure Avanti Flow. It's both a DAB radio and an internet radio. And an FM radio, in fact. And an iPod dock. And a uPnP-compatible media streamer. It has an auxiliary input, too. Oh, and it'll wake you up to any of the above in the morning. What we do have, then, is a single point of output for a multitude of audio inputs, designed to unite your personal music collection, stored on your iPod or PC, with that of thousands of internet DJs, broadcasting everything from rare Beatles bootlegs to Hindi folk songs. While its shape and size resembles the kind of high-end CD player you'd expect from the likes of Bang & Olufsen or Bose, there's no 'old' media here; the Avanti Flow is a celebration of vast, virtual music collections. It's described as a 'digital audio system', and as generic as that sounds, it's probably as specific as you can get without ignoring part of the Flow's core functionality. As its significant weight might suggest, the Flow is beautifully realised. The build quality is worth its price alone, while the increasingly tired "piano black" buzzword is perhaps more acceptable here than ever; if we were to compare the unit's construction, looks and acoustic craftsmanship to anything, it'd be a Steinway grand. It's also one of the only appliances we've seen pull off chrome detailing without looking tacky. And while the unit's 16 chrome buttons - all with embossed, rather than illuminated, logos - aren't the easiest to identify initially, they're delightfully tactile. Even the packaging oozes quality, from the neatly-illustrated iPod dock adaptor selection to the soft draw-string bag, tied lovingly with a knot, keeping the Avanti safe until you unwrap it. This attention to detail continues right down to the unit's core functionality. At first glance, for example, the included remote control resembles a fairly ordinary infra-red remote. That is, until you use it from another room entirely and it still works. We do wonder how long it'll take new owners, used to directional TV remotes, to realise they needn't point in the direction of the player at all. Internet radio comes in the form of Pure's The Lounge, a media portal providing access to thousands of worldwide radio stations as well as 'catch up' content such as the BBC's Listen Again. After an initial online registration for The Lounge using your player's serial number, you're also given the link to download a Pure-branded version of the TwonkyMedia server software. This is simplest way to quickly enable the Avanti to access your music collection on your computer, though if you're lucky enough to host your music collection on a uPnP-compatible NAS server, it's as simple as searching for servers and hitting play. The speaker setup consists of two forward-facing mid/treble speakers and a hefty down-facing subwoofer, capable of enormously impressive, room-shaking, bass. Similarly, and while it does suffer slightly from that 'small box' thuddiness that's more to do with the inescapable physics of a small cabinet than poor acoustic design, treble is punchy and bright. Many small systems packing this level of speaker hardware start to tear themselves apart at anything close to full volume, distorting and vibrating long before the volume hits maximum. But while the Avanti's 'full' isn't quite as loud as many systems in this class, its quality never falters, providing smooth, vibration-less bass notes and the same sibilant treble throughout. 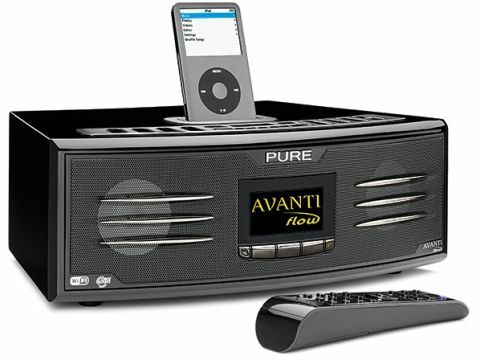 The Avanti's connectivity opens it up to a huge amount of post-purchase content, such as PURE Sounds - the virtual equivalent of those mood music stands found in holistic medicine shops. Fall asleep to the sound of a babbling brook, birdsong or the quiet roar of the ocean. We should point out that it's not all meditative - you can also enjoy the sound of a severe earthquake, a Toyota Supra (1994) or, more disturbingly, 'heart monitor'. Our point, however, is that there's so much exclusive content available that should you never use the DAB function or set up a streaming media server, you'll still never feel like you're not making the most of your purchase. It may be a hefty outlay, but if you can't live without your own personal soundtrack and want a single, sleek box that'll unite a host of sources, your choice in hardware is made very simple by the Avanti Flow - a do-all appliance that, if you have the cash, we recommend without hesitation.